For many people, nothing brings back Christmas memories like the site of a train circling a Christmas tree - a century-old tradition. In the early days, tinplate or cardboard buildings were often set up near the tracks, a tradition that presaged today's porcelain holiday villages, many of which include trains as well. The first Big Christmas Trains™ page was set up in 2004 as a "buyer's guide" to answer reader questions about what kind of trains go best with Christmas trees or villages (or, in some cases, both). More questions came in, and we put up other pages to answer those questions. Eventually, we even started a newsletter for folks interested in Christmas villages and the trains that go with them. We've also explored the topic of setting up big outdoor railroads at Christmas. In other words, we started out using the word "big" to describe the trains. But the hobbies we've supported and - in at least one case - started have become "big" as well, leading to dozens of articles spread across three different web sites. So it's high time to have an index page that pulls all of these resources together in one place for folks who haven't spent as much time surfing our sites as we have building them. That said, when we started this project we realized that there was a lot of information we should have included but hadn't yet. So many of the articles we link to on this page were either created or seriously updated in the last few years. Enjoy! What is a Christmas Train? On these pages, we use the term Christmas Train to describe electric trains that are decorated specifically for Christmas, or any trains that are used only during the holiday season. They may be set up indoors or out; they may run around trees or around towns, or they may just bump back and forth on the bookcase. Also, "big" means trains that are bigger than the ever-popular HO scale trains, which are nevertheless too small to use effectively with Christmas trees or even with most Christmas villages. Which Christmas Train Should I Buy? Many folks want to know which train they should buy, but of course different kinds of trains work for different kinds of setups. We recommend that you check out the first few articles that this page links to before you make your decision. But if you're in a real hurry, here's a very short list to give you a head start. For outdoor displays, commercial displays, and very large Christmas Trees, consider Large Scale Christmas Trains. Bachmann On30 Christmas trains come in sets with Christmas colors, and everything you need in one box. 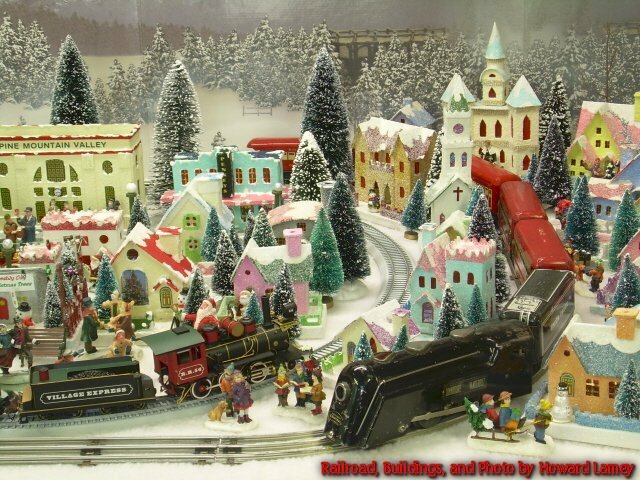 Hawthorne Village train collections are sold a piece at a time in collections inspired by popular painters (like Thomas Kinkade(r)), movies, brand names (like Coca Cola(r)), even television specials (like Rudolph the Red-Nosed Reindeer(r)). Here are links to articles you will find useful when you are choosing and using a Big Christmas Train. Sizes and Scales of Big Christmas Trains - Contains more details about the relative sizes of the Big Christmas Trains listed above. Choosing Christmas Trains and Villages - Describes more options for picking out or making Christmas villages, as well as for choosing trains for your towns. This article answers questions like "How Big are Christmas Villages and the Trains that Go With Them?" "Where do Christmas Towns Come From?" "Where do Christmas Trains Come From?" and "What if You Don't Have Room for a 38" Track Circle?" A Brief History of Christmas Villages - Includes brief descriptions of many options and resources that are still available today. From Family Christmas Online™. What Do Trains Have to Do With Christmas? - Explains why may folks are more likely to think about trains around the holidays. Also relates how and why, for nearly sixty years, electric trains were the centerpiece of many families' indoor Christmas decorating. From Family Christmas Online™. The following articles from our collection have free instructions and plans for inexpensive projects that will look great on your mantel, holiday village, or railroad. Several other articles that apply to any indoor village or railroad are listed farther down the page. Enjoy, but let us know if you find the articles useful. In addition, you can help by sending us project tips, article ideas, and photos of your railroads and villages. We want this site to be as useful as possible to as many people as it can be. As the hobbies we serve grow, we all benefit. Combining Trains and Towns - Why combining collectible village pieces and model trains is a growing and rewarding hobby. Free Scenery Set Pieces - Add a vertical dimension to your holiday village for little or no investment. 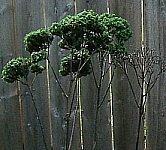 The technique can easily be adapted to all seasons. What is a Glitterhouse? - Collecting and building authentic, vintage-style pasteboard houses. Includes many free downloadable plans, photos, and detailed instructions. We also provide instructions for making scenic accessories designed to go with any Christmas village. "Tribute to Tinplate" Articles Here's a series of projects that pay "Tribute to Tinplate," based on the tinplated-steel trains and towns of a century ago. Free downloadable commercial-grade graphics and instructions will help you inexpensively add an authentic vintage look to any indoor railroad. Most projects have multiple pre-scaled plans and graphics, so you can easily add a vintage look to ANY railroad or holiday village. We have more on the drawing board, so be sure and check back. If you're concerned about the scales of your trains and towns, and the articles above don't give you all of the information you need, check out the following. Once you've taken a look, let us know if you still have questions. Which (Garden Train) Scale Should I Model? - Scale and gauge issues for "Large Scale" trains - the kind that run on 45mm/1.775" track outdoors - are much more complicated than they are for indoor trains. For that reason, our Family Garden Trains™ site has a whole article dedicated just to that subject. If you are planning to get into Large Scale trains, and you want some straight answers to complicated questions, check it out. To see Part 5, click here. If you've tried any of the links above, you'll notice that some of them are on our "sister sites," of which there are many. Back in 1999 when I started my first model-train-related site, it never occurred to me that it would stir up so much interest in so many related subjects - or that articles on those subjects would stir up so much interest in other subjects. Eventually our first two sites grew so large and addressed so many topics that they were almost impossible to administrate. Since then, whenever I get a lot of questions about a particular topic, I evaluate whether it makes more sense to start a new site than to try to shoehorn another subject into one of our existing sites. In most case, the new, targeted site, also adds readers and grows rapidly, too, so this seems like the way to go. At the moment, I have twenty-some active domain names serving about twelve different web pages, most of which have their own sets of readers, although I do combine newsletters where I can. The following list does NOT show all of our web pages - only the ones that have at least some information that might be of interest to folks who like Christmas trains and towns. As always, if you have any questions, please contact us, and we'll do our best to answer your question in a timely manner - or point you to the answer if we've already spelled it out somewhere. In the meantime, the following list provides links to web sites that may help your Christmas train and town hobby. Most are mine, though a few belong to friends who have helped me and my readers. HalloweenTrains.com™ - Provides buyers' guides, projects, tips, and resources for displaying Halloween trains and towns. BIG Indoor Trains™ - Provides hundredsof projects and related artcles for setting up a temporary or permanent model railroad indoors, including dozens of articles that apply to Christmas trains and towns. CardboardChristmas.com™ - A directory of articles about building, collecting, and displaying cardboard Christmas houses (also known as "putz" houses or "glitterhouses."). Includes a discussion forum to which several master craftspeople contribute. Also includes an archive of Papa Ted's encyclopedic web page about putz houses (below). Family Christmas Online™ - A collection of articles about Christmas in general, including traditions, songs, decorations, recipies, and memory sharing. BIG Train Store™ - A buyer's guide to O gauge and On30 trains that are decorated for year-round use. 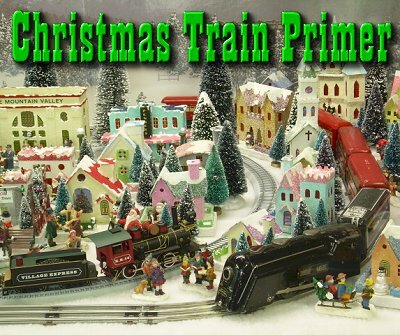 Includes quite a few trains and accessories that work as well on Christmas and display villages as they do on model railroads. LittleGlitterHouses.com™ - Howard Lamey's gallery of custom-built putz houses and related items, including dozens of "how to articles" for building your own. Papa Ted's Place - The internet's largest collection of information and photos of cardboard christmas ("putz") houses, compiled by "Papa Ted" Althof over a twenty-some year period. Family Garden Trains™ - Our first train-related web page, dedicated to folks who run big model trains outside.